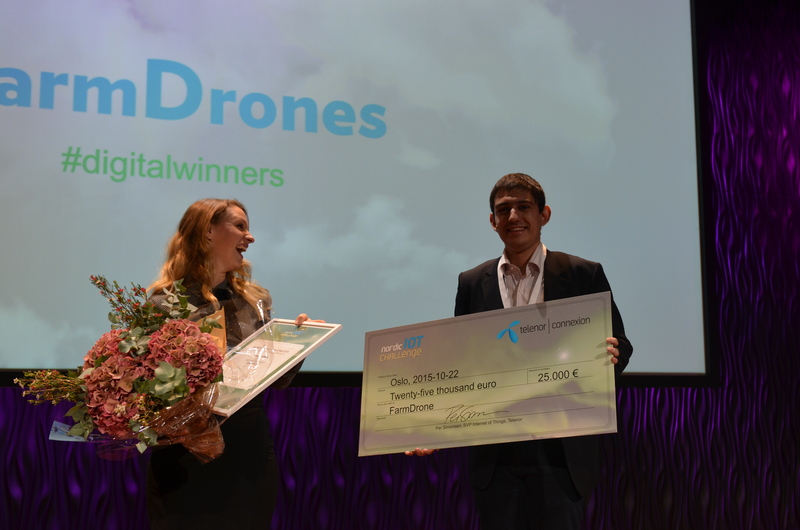 FarmDrones, a connected solution for farmers to increase productivity and crops yield, was awarded €25,000 and six months of guidance and mentoring by the Telenor Advisory Team. Telenor Connexion today announced the winner of the 2015 Nordic IoT Challenge, an initiative to recognise innovation and excellence within the Internet of Things (IoT) arena. The grand prize winner is FarmDrones, a connected solution for farmers to increase productivity and crops yield. The prize includes €25,000 and six months of guidance and mentoring by the Telenor Advisory Team. The concept developed by innovators Therese von Hackwitz, Andreas Karlsson, and Krum Vlakov in Gothenburg, Sweden, focuses on helping farmers maximize productivity and crop-yield through increased optimization of land, targeted data analysis, and supportive software. “With a constantly growing population the need for improved productivity andsustainability within farming and food production is a fact. FarmDrones smart use of new, connected technology and advanced data analytics to transform future farming is not only innovative, but also addressing a critical world challenge,” says Per Simonsen, Senior VP, Internet of Things at Telenor. The announcement was made at the Digital Winners Conference in Oslo, Norway. FarmDrones, as well as runners-up Minalyze and hidn tempo, gave pitches to leaders in the Internet of Things sector after which the Nordic IoT Challenge Jury awarded FarmDrones the Grand Prize. Minalyze was awarded Second Place with hidn tempo taking Third Place. The Nordic IoT Challenge received innovative and transformative proposals from all Nordic countries throughout August and September. Proposals included devices and concepts from fields as diverse as smart city developments, wearables, medical implements, and industrial sector transformation.